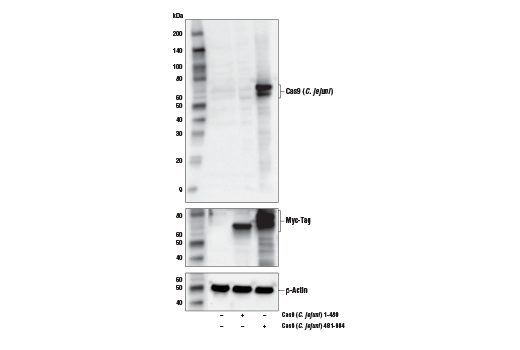 Western blot analysis of extracts from 293T cells, mock transfected (-) or transfected with a construct expressing one of two indicated N- and C- terminal fragments of Cas9 (C. jejuni) using Cas9 (C. jejuni) Antibody (upper), Myc-Tag (71D10) Rabbit mAb #2278 (middle), and β-Actin (13E5) Rabbit mAb #4970 (lower). The predicted epitope of Cas9 (C. jejuni) Antibody is a peptide region surrounding Val965 of Cas9 (C. jejuni) protein. As anticipated, Cas9 (C. jejuni) Antibody detects bands corresponding to C-terminal fragment of Cas9 (C. jejuni) and does not cross-react with the N-terminal fragment of the protein. Supplied in 10 mM sodium HEPES (pH 7.5), 150 mM NaCl, 100 µg/ml BSA and 50% glycerol. Store at –20°C. Do not aliquot the antibody. Cas9 (C. jejuni) recognizes transfected Cas9 (C. jejuni) protein. Polyclonal antibodies are produced by immunizing animals with a synthetic peptide corresponding to residues surrounding Val965 of C. jejuni Cas9 protein. Antibodies are purified by protein A and peptide affinity chromatography. The CRISPR associated protein 9 (Cas9) is an RNA-guided DNA nuclease and part of the CRISPR antiviral immunity system that provides adaptive immunity against extra chromosomal genetic material (1). The CRISPR antiviral mechanism of action involves three steps: (i), acquisition of foreign DNA by host bacterium; (ii), synthesis and maturation of CRISPR RNA (crRNA), followed by the formation of RNA-Cas nuclease protein complexes; and (iii), target interference through recognition of foreign DNA by the complex and its cleavage by Cas nuclease activity (2). The type II CRISPR/Cas antiviral immunity system provides a powerful tool for precise genome editing and has potential for specific gene regulation and therapeutic applications (3). The Cas9 protein and a guide RNA consisting of a fusion between a crRNA and a trans-activating crRNA (tracrRNA) must be introduced or expressed in a cell. A 20-nucleotide sequence at the 5' end of the guide RNA directs Cas9 to a specific DNA target site. As a result, Cas9 can be "programmed" to cut various DNA sites both in vitro and in cells and organisms. CRISPR/Cas9 genome editing tools have been used in many organisms, including mouse and human cells (4,5). Research studies demonstrate that CRISPR can be used to generate mutant alleles or reporter genes in rodents and primate embryonic stem cells (6-8). Cas9 (C. jejuni) is a Cas9 ortholog that is smaller, but as efficient, as the more commonly used Cas9 ortholog, Cas9 (S. Pyogenes) (9). Horvath, P. and Barrangou, R. (2010) Science 327, 167-70. Wiedenheft, B. et al. (2012) Nature 482, 331-8. Singh, P. et al. (2015) Genetics 199, 1-15. Cong, L. et al. (2013) Science 339, 819-23. Mali, P. et al. (2013) Science 339, 823-6. Li, D. et al. (2013) Nat Biotechnol 31, 681-3. Shen, B. et al. (2013) Cell Res 23, 720-3. Niu, Y. et al. (2014) Cell 156, 836-43. Kim, E. et al. (2017) Nat Commun 8, 14500.